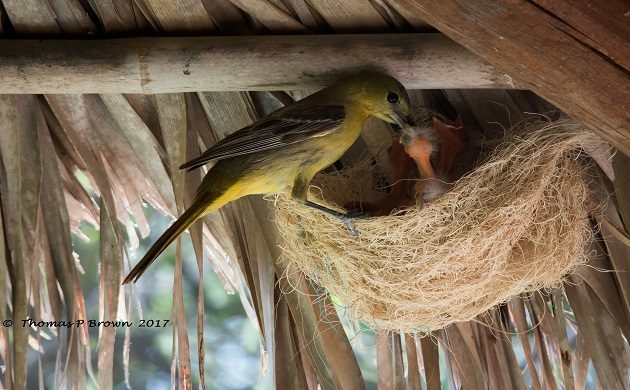 When it comes to nest construction, few if any birds rival the detail put into their nests, like members of the oriole family. 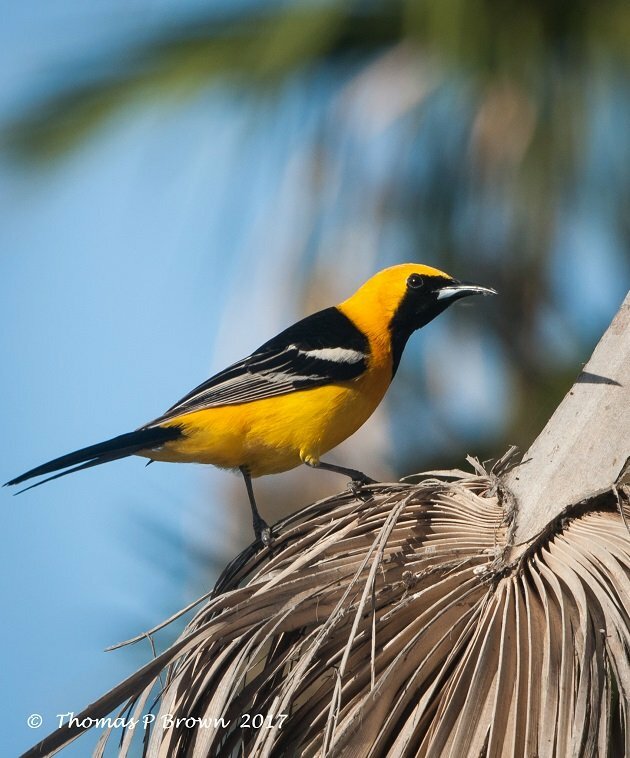 Here in the southern half of the Baja, we have both Hooded and Scott’s Orioles, with the Hooded variety being quite a bit more common. 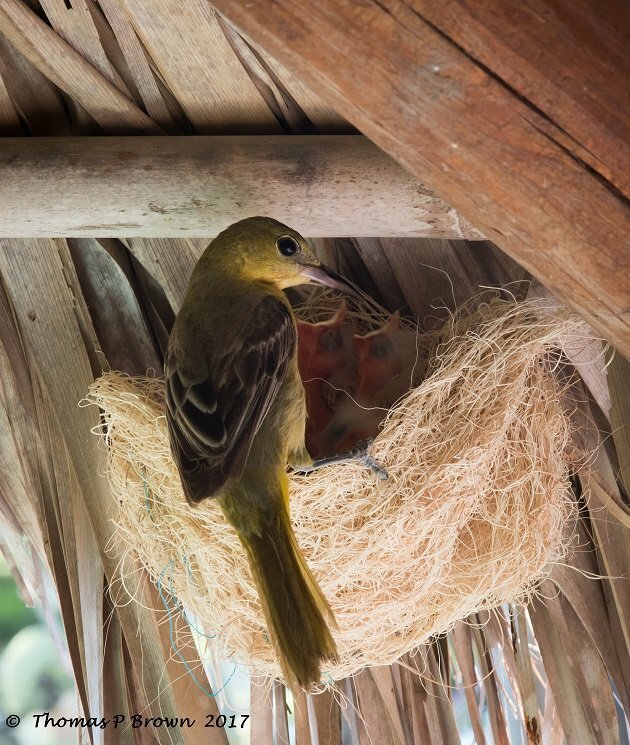 The intricacies that they go to in weaving the nests, pulling thread after thread from the edges of the palms to do the construction with. Then, literally sewing them into the palm fronds with their long bills, is to me, such a marvel. If you managed to read last Wednesdays posting, you will already know that my wife and I spent a very lazy, quiet weekend in Cabo Pulmo, Mexico. We had rented a small casita, and were in need of a little down time to ourselves. 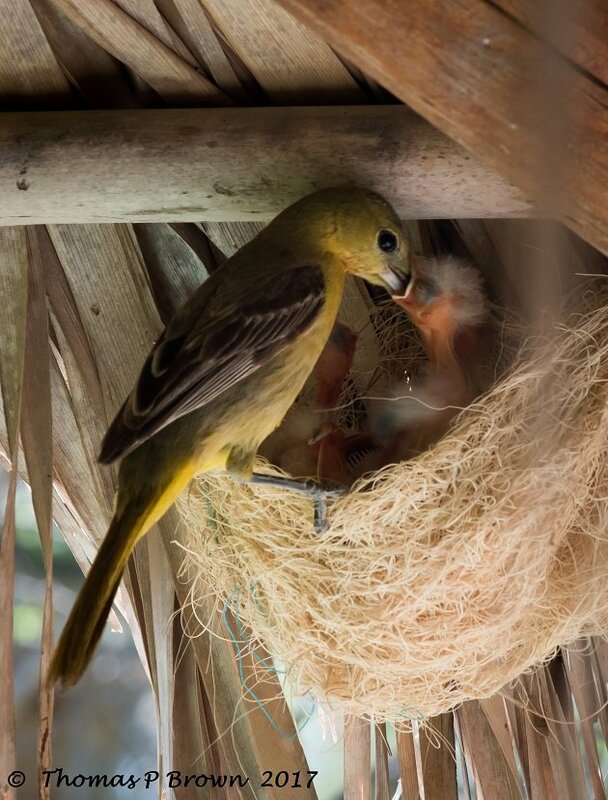 White sitting on the porch, I got to watch a pair of Hooded Orioles, who had a brand new set of babies just hatch, go thru their paces, feeding, feeding and more feeding. 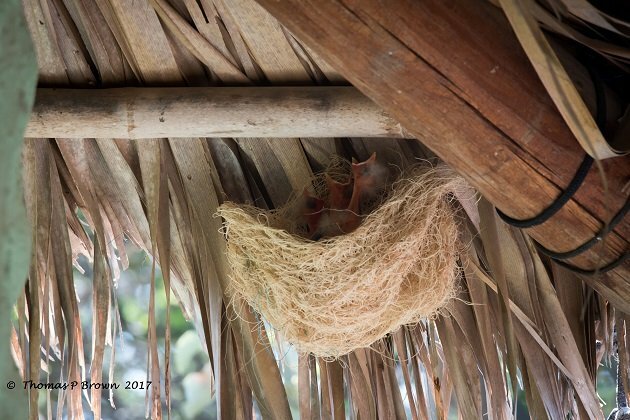 They had located their nest just a few feet from my chair, in the shade, up under the eve of our casita. 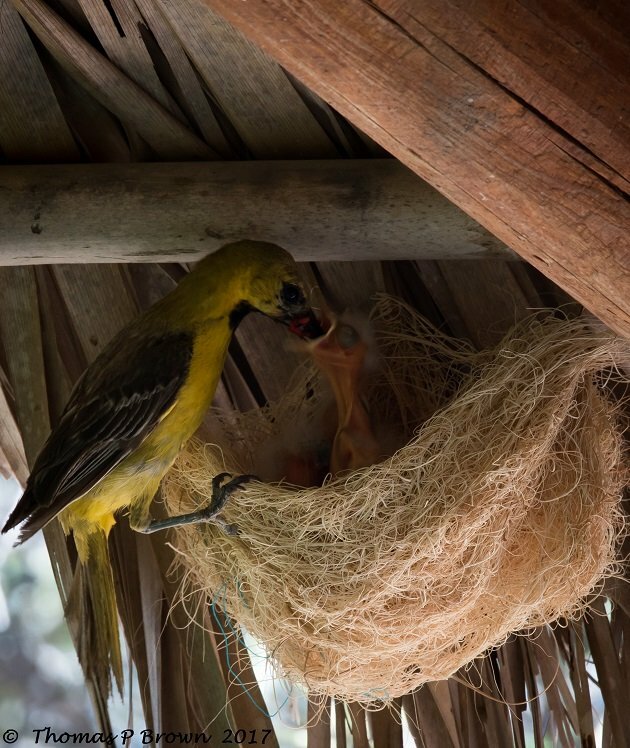 Local casitas in this area all have palm roofs, so this makes for the perfect location to weave one of these beautiful nests. This is quite possibly the first time in my life where I had literally nothing more in the world to do, but sit there and watch them. Between the feeding and its associated behaviors, and the birds in the bird bath, and visits with my lovely wife, it was as good as it can get! 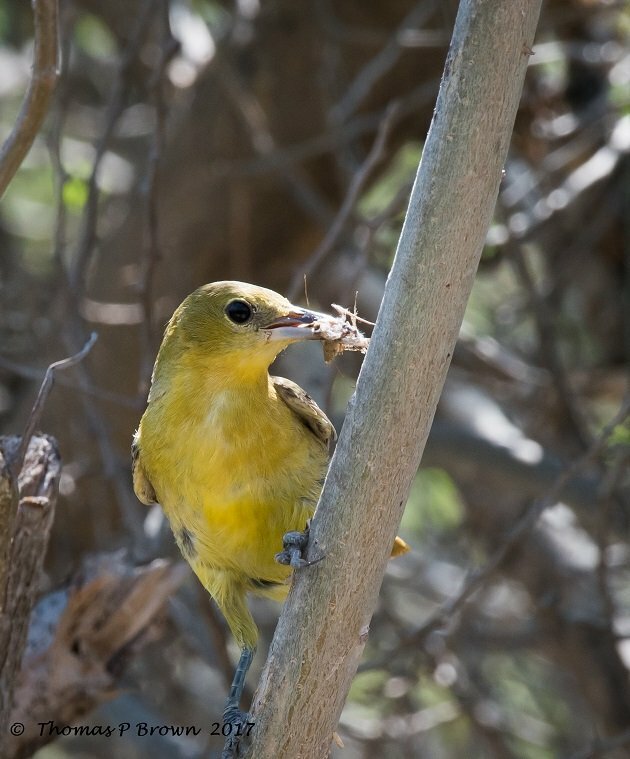 There were a few interesting observations that I gleaned from prolonged sitting on my backside, watching these hard working birds, providing for their little ones. I don’t claim for these to be scientific in any manner, just little oddities that I noticed in two days of lethargic observation. When it came to feeding, the female did 75% of the heavy work. She was in and out any times more often that the male. The male bird that was there to help out, a little bit any way, was actually a first year juvenile. 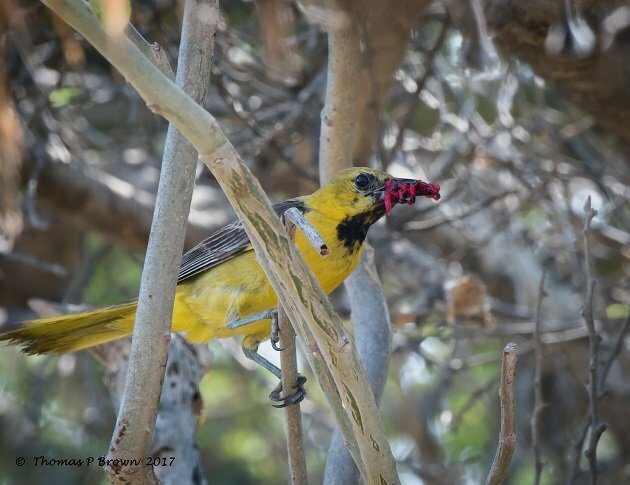 The mature male Hooded Oriole that did show up occasionally was violently run off by the female, many times with a couple of missing feathers to show for his appearance, or perhaps lack of follow thru? Dead Beat Dad syndrome? The female, brought almost 100% of the time, a variety of insects for the little ones to snack on. The young male always brought a few different types of berries from the area, I think it had to do with ease of collection. 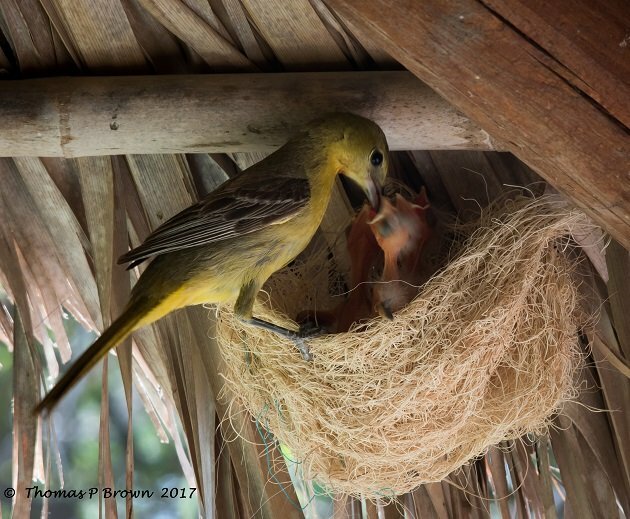 The female, when landing on the nest, fed one baby, and flew away. It was hard to tell if it was a different one each time, but only one excited little mouth got filled when she arrived. She was in, filled a mouth, and was out. The Male, spread his mouth full of berries around, everybody getting a little and actually spent quite a bit of time doing so. The female had a habit of doing a quick clean up, each time before she flew away, grabbing a dropping, or stray nest part on her way out. The male, well….he fed the babies…..and was gone.